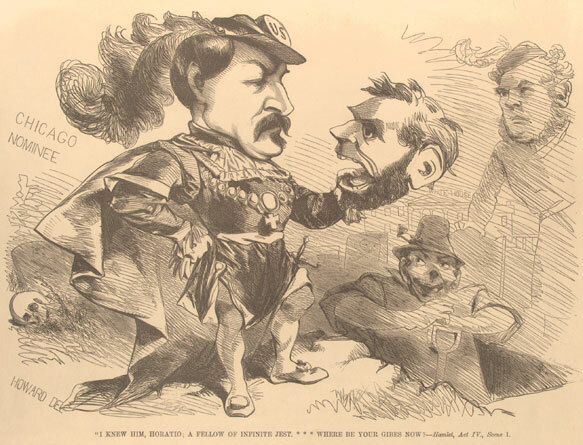 Description: McClellan, in the character of Hamlet stands near an open grave holding the head of Abraham Lincoln. He soliloquizes, “I knew him, Horatio: A fellow of infinite jest . . . Where be your gibes now?” The cartoon evidently appeared following publication in the “New York World” of a scandalous but fabricated account of callous levity displayed by Lincoln while touring the battlefield at Antietam. (See also “The Commander-in-Chief conciliating the Soldier’s Votes,” no. 1864-31.) McClellan’s lines here come from “Hamlet,” act 4, scene 1, which takes place in a graveyard, where a gravedigger throws up the skull of Yorick, the king’s jester. Hamlet picks up the skull and meditates on the nature of life. At left are the words, “Chicago Nominee,” referring to McClellan. At right an Irish gravedigger pauses in his work. Horatio (far right) is New York governor and prominent Peace Democrat Horatio Seymour. The White House is visible in the distance.